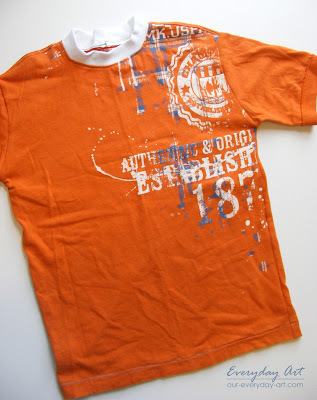 What little boy doesn't need a few new t-shirts for spring? I know mine always does. For the last few years I've been taking my husbands old shirts and re-purposing them as t-shirts for my son. He LOVES them. In fact, when he was younger he called them his "Daddy Shirts". I love that they're free and get us through the summer spending a little less on clothes. 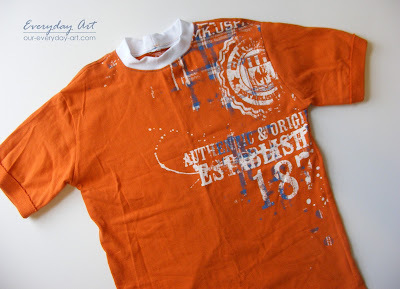 I used this same idea to make my son's 'Kid's Art Inspired Shirt'. I also love that they're quick and easy to make. That's my kind of project! I don't have a full step-by-step tutorial, but here's the basic idea to help you create your own. 1. Trace a t-shirt you already have onto an existing larger shirt. Line-up the bottoms of the large and small shirts so you can use the hem that's already there. Trace the sleaves right on the existing sleaves, again using the existing hem. Okay, so here's a little secret. I never actually trace the small shirt, I just lay it on top and start cutting around it. I know it's crazy, but it saves me couple minutes. It's not like I haven't made a few of these before :). If you don't want to be crazy and just start chopping your fabric to bits there are a couple other (safer) options. A. you can trace a pattern onto paper, cut it out, pin it on the large shirt and then cut. B. Use a marker or fabric pen and trace directly onto the larger shirt. If you choose this option I would recommend turning the shirts inside-out just in case you make a mistake or two tracing. 2. Cut-out the pieces, adding 1/4 inch seam allowance. Do NOT cut on the fold lines! 3. Sew the shirt together. With right sides of the fabric together, sew the front to the back at the side-seams and shoulder seams. Sew the sleaves together at the under-arm seam. Then sew the sleaves in to the shirt, making sure the seams (under-arm and side) line-up. 4. Make the collar and sew it on. First measure around the neck opening. (Let's pretend it's 18 inches). 2 1/2 inches, and the seam is hidden inside. 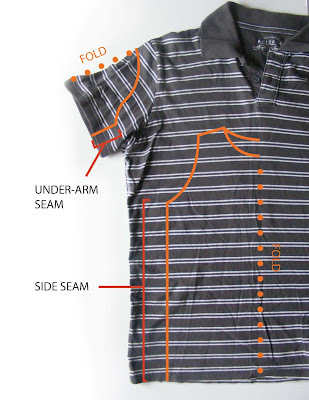 The fold is the top of the collar, and the raw edges attach to the shirt. Sew it on so the seam is on the inside of the shirt. 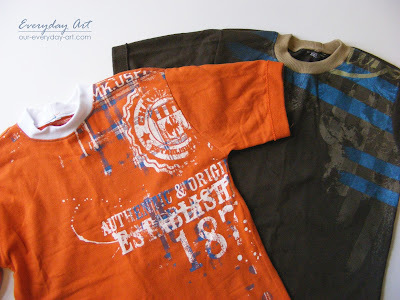 Bonus, if you're using an old t-shirt instead of a polo like I did, you can actually just take the existing collar right out of the old shirt and shorten it to kid's size rather than using rib-knit. That's it! You have a shirt. I know it took a while to explain, but it really is easy. One more hint... it helps to pre-shrink the rib knit. I didn't (because I was lazy) and the tan collar on the brown shirt totally shrunk!! Yah, not cool. He can still get it on, but see how tiny and bunched it is now? I'm going to have to take that off and try again. Guess it pays to do it right the first time. Anyway... go dig through your husbands drawers. 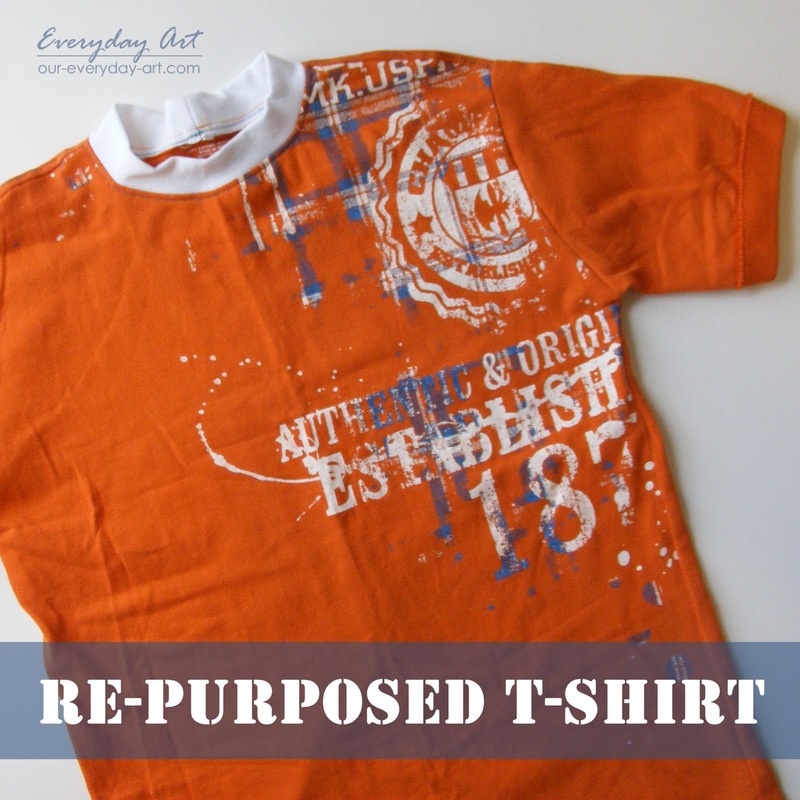 Get rid of something he really doesn't want to wear anymore and make something your kids will love. for free!